These Cosmetics Tests Use Animals For Our ‘Safety’ – But Should They? You’re walking down the aisle in your local cosmetics shop or drug store and you spot a great new line of moisturizing lipstick or blemish balm. You pick it up and scan the back of the product to see if it matches what you’re looking for – long lasting color? Breakout protection? Great for dry skin? You know this check matters when choosing cosmetics to see if the product will work as promised or if it will just leave you feeling greasier than a fast food joint menu. But you notice a little symbol on one of the packages – “cruelty-free, not tested on animals.” The symbol features a small bunny or “V” icon. If you’ve ever wondered why it’s so important for companies to put this label on their products or if you’ve ever wondered what’s the real harm in a little animal testing for the safety of customers, perhaps it is time to see just what animal testing entails in the cosmetics industry. Not everyone likes rats, that’s for sure. While I’ve met my share of people who love keeping rats as pets and would praise them for their unique personalities and friendliness – they’re known for being playful, curious, and desire physical and mental stimulation and bonding with their human companions, I’ve also met my share of people who are afraid of, or even disgusted by, rats. And you know what? That’s totally OK. There’s no reason why anyone has to turn into a rat lover right this minute. Because the truth is, you don’t have to love rats to know that what they endure in testing facilities is just not right. They are put through acute oral and dermal toxicity tests, where they “experience diarrhea, convulsions, bleeding from the mouth, seizures, paralysis” and eventually death. The function of a toxicity test is to see how long it takes half or more of the test subjects to die from exposure to the chemical or product. For other tests, they can be force-fed dangerous substances or have tubes attached directly to their throats, again to test for toxicity and other bodily affects. Tests aimed at discovering a substance might, if at all, affect fertility, rats are mated, then the pregnant mother is exposed directly to the substances, and finally she is either killed or allowed to give birth so she can be killed alongside her offspring. Although safe and effective artificial skin testing methods like EpiSkin, EpiDerm, and SkinEthic have been created as a cruelty-free alternative to the harsh dermal toxicity testing described above, the practice still continues as labs see animals’ lives as disposable, but money and time as valuable as the scientist’s own life itself. Dogs and Cats – Household Pets or Disposable Test Subjects? Cats are much less likely used for cosmetics testing (though the possibility still exists) and more likely used for neurological research. However, they are still exposed to chemicals and products that make their way onto the consumer market. While supposed law restrictions on animal testing have been set over recent years, it’s not impossible to find dogs and other animals we normally wouldn’t think of as test subjects – such as primates – as victims of this industry. Outsourcing animal testing to countries with different laws on these practices is the major loophole that gets routinely exploited by numerous companies. But Aren’t These Tests Necessary? While it may all seem very cruel and unjust, some argue that this testing is necessary for the consumer’s safety. 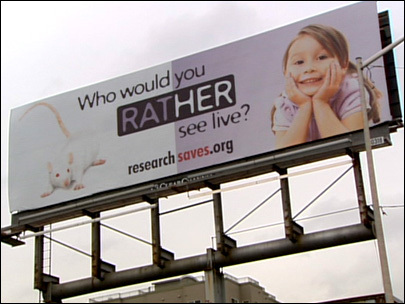 “After all, who would you rather have die – a rat, or a little girl?” Don’t think that is an exaggeration of their position. When it comes down to it, people may argue that there’s no need to show more compassion to a non-human animal than they do the human consumer. But how much compassion does it really take, and how much of a risk do we put ourselves at? In both cases: not much. Safe, cruelty-free alternatives in cosmetics already exist by the bundle. Companies like the Leaping Bunny make sure to let the average consumer know that refusing cosmetics that test on animals is an easy choice to make, all it needs to be is a conscious one. There are also many reasons to believe that animal-free alternatives are actually the better way to go for all of us. According to the New-England Anti-Vivisection Society: such tests can be more reliable and accurate, cost-efficient, practical, and environmentally friendly. They list national reports which suggest the limitations of animal-based testing are more costly than they are helpful. Ultimately, it seems, if you want your cosmetics to be safer for you and those you love, you’ll also want them to be free of animal testing and instead making use of modern technology to the best of its ability. This kind of this is so unnecessary today. Makes me so angry!